Who the hell needs bad news? Well, we all do. At least if it’s bad news for the state, capital, and patriarchy. B(A)D News is a monthly English language info show founded at the 2013 Anarchist Balkan Bookfair in Slovenia as the International Network of Anarchist and Anti-authoritarian Radio Projects, known as A-Radio Network (A-RN). 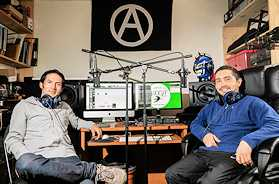 Participants were Anarchist Radio Berlin, Radio Libertaire from Paris and Crna Luknja (“Black Hole”) from Slovenia’s capital, Ljubljana, as well as by individual radio activists from Eastern Europe. ARN is a podcast and a radio station as well as a radio show, and has developed considerably since its beginning. Despite its starting point, the network overcame its European-centered membership by reaching across the Atlantic with the addition of comrades from the US, then Latin America (Chile, El Salvador, and Argentina). It is establishing global connections between active projects around the world and promoting the creation of new ones. It currently has about 20 projects participating. Since 2015, a yearly network gathering takes place in different European cities; once in Ljubljana, once in Athens and twice in Berlin, with a fifth meeting scheduled for 2019 in Switzerland. Those meetings, where members of the participating projects see each other face to face instead of only hearing voices on the air), foster a web of trust being built over time, but also provide a forum for concrete knowledge exchange. Meetings are instructional, teaching how to build antennas, edit radio shows, and how to safeguard our people while reporting from the streets and much more. Furthermore, it’s a pool of ideas and networking, from where other projects and cooperations are born. The B(A)D News program is broadcast on the 15th of each month providing information from the perspective and experience of the respective radio project, mostly dealing with topics such as anarchist prisoners, social struggles, repression, environmental and feminist struggles. The production of the episode rotates monthly, leading to each sounding a bit different as every collective has their own style, equipment, and accent. Listeners might have to forgive what they describe as “painfully dealing with the English language,” but for the most part, all the broadcasters are readily understandable. For A-RN, audio is an unmediated expression of our struggles, is less resource needy than video, and much more direct than text. Plus, even if you don’t normally listen to radio or pod-casts their show might give insight into regions which are not usually heard from directly. 2) We want to broadcast a Spanish version of B(A)D News, but due to restricted resources we managed to do this only once. If you are interested in helping with Spanish translations or voice-recording, email aradio-berlin@riseup.net.